When a coach yanks a goalie, it’s normally because a team trails by a goal or two late and needs a sixth attacker. Every once in a while, it’s because he feels a goalie change could give his team a spark. Rarely, if ever, is that time when the score is tied with just over seven minutes left in the game. But for Minnesota Wild coach Bruce Boudreau, that time was Wednesday night. After Ottawa scored twice in 83 seconds to even the game at 4, out went Devan Dubnyk and in went Alex Stalock. Sixty-seven seconds after the switch, Eric Staal lit the lamp, followed by an empty-netter from Eric Fehr to wrap up an unusual 6-4 win. Only time will tell if Boudreau has to roll the dice in that manner again Friday when Minnesota welcomes the Winnipeg Jets to Xcel Energy Center in St. Paul, Minn. But as he showed then and has showed before, he’s not afraid to make any move that he feels gives his team a better chance to win. Stalock only had to face one shot, but got credit for the win. 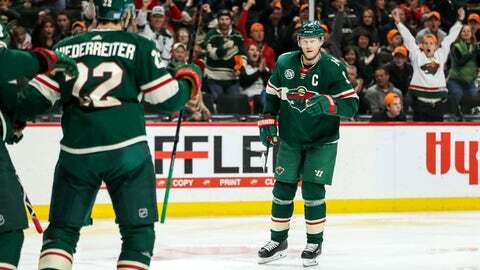 His unusual relief appearance helped the Wild (13-7-2) break out of a second-place tie in the Central Division with Winnipeg, further setting the stage for the teams’ first meeting since the Jets’ first round playoff elimination of Minnesota last spring. Winnipeg (12-6-2) has followed up its first appearance in a conference final with a good start, although it turned in a clunker Wednesday night. The Jets yielded five first period goals to Calgary and never threatened after that in a 6-3 defeat. Like Dubnyk, Jets goalie Connor Hellebuyck didn’t finish what he started Wednesday night. The difference was Hellebuyck didn’t even make it out of the first period, leaving at the 11:35 mark after Matthew Tkaczuk’s 12th goal made it 3-1. Hellebuyck (9-5-1, 2.90, .909) is expected to get the start in net Friday, while Dubnyk (9-5-2, 2.48, .921) figures to get the call for the Wild. With three days off before a visit from Arizona, it would be surprising if Dubnyk, who’s one of the league’s most reliable workhorses, wasn’t in the net. Minnesota used its Thanksgiving morning practice to make some line changes. Charlie Coyle moved up to the second line with Mikko Koivu and Zach Parise, while right wing Nino Niederreiter was dropped all the way to the fourth line. Niederreiter endured a no-shot, minus-three game Wednesday night. He’s managed just two goals — both on the power play — and eight assists in 22 games.